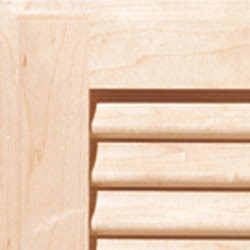 Channel the look of louvers by using Louver Style doors made of solid wood. These un-vented styles achieve a stylized look without the functionality of vented, movable louvers and therefore eliminate the possibility of broken or damaged louvers. If ventilation isn't necessary, our variety of Louver Style doors are a perfect fit. If you need true louver doors with vented slats please visit our Specialty section.